The British steam ship Somme was built as the War Toucan in 1919 by the Short Brothers Limited of Pallion, Sunderland, England. She was hull number 405 and she was commissioned by the Shipping Controller, part of the British government. Then, in August 1919 before she was completed the hull was purchased by the Royal Mail Steam Packet Company Limited (known as the Royal Mail Lines) of Leadenhall Street, London and it was renamed Somme. The ship’s dimensions were 5,265 gross registered tons (GRT), with a carrying capacity of 8,150 deadweight tons. She was 412 feet long overall, 52.5 feet wide and 25.3 feet deep. A triple expansion engine turned a single screw with 201 net horsepower to achieve 10.5 knots. 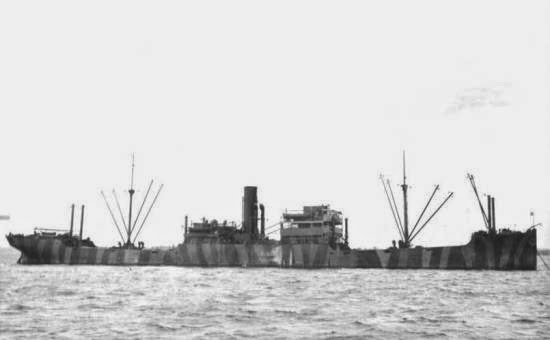 The vessel was armed and designed as a World War I B-class standard cargo ship of the British design. The master on board the Somme for her final voyage was Captain Clarence Cornish Prosser, aged 47. He was supported by Chief Officer Robert Goronwy Owen, aged 44. There were a number of gunners and British Army personnel aboard to man the guns: ten of them. Aside from one New Zealander from Taranaki, John Brew, aged 35, an able seaman, the crew of 58 total were British. There were seven teenagers, the youngest among them Stanley Cox, steward’s boy, aged 16. There were 21 young men in their twenties. The Somme left Liverpool bound for Bermuda on the 1st of February 1942. There were 45 merchant ships and 13 escorts in outbound Convoy ON 62 in which the Somme sailed, along with 13 military escorts. The convoy stopped to assemble in Loch Ewe. Then after two weeks, on the 15th of February the convoy dispersed. Somme was to call at Bermuda and then her ultimate destination was Curacao. Though probably the ship was in ballast, part of the cargo she carried was a smallish motor boat called a launch. Three days after dispersing from the convoy the Somme was 530 nautical miles southeast of Nantucket, 250 nautical miles northeast of Bermuda, and 550 nautical miles south of Halifax. At ten knots the ship would have been only a full day’s steaming from its destination of Bermuda. Korvettenkapitän Klaus Scholtz, in command of U-108 had other ideas for the Somme. Klaus Scholtz, aged 33, from Magdeburg, Germany, earned the Knights Cross just over a month before. U-108 was part of the second wave sent to maintain Operation Drumbeat, along with U-103, U-106 and U-107. U-108 entered the area northwest of Bermuda and headed east on the 15th of February 1942. The following day it sank the Ramapo, Panamanian flag, of 2,968 tons. After a dog-leg to the southeast, on the 17th Scholtz resumed course for Lorient and the next day came upon the Somme. At 4:27 pm local time on Wednesday the 18th of February 1942 Scholtz hit the Somme amidships with a single torpedo. As the merchant ship began to sink by the stern most if not all of the 58 men on board managed to abandon ship in three different lifeboats. Eleven minutes after the initial attack, at 4:38 pm, Scholtz fired a second, coup-de-grâce, into the hull, and the Somme quickly sank by the stern. U-108 maneuvered amongst the lifeboats and questioned the survivors. No member of the survivors in any of the three Somme lifeboats was ever seen again. All perished. Just over an hour later Scholtz came upon a the motor launch which had been the deck cargo of the Somme. U-108’s gunners fired at it with 20-millimeter anti-aircraft guns until they thought it would sink. However this bit of flotsam from the wreck would wreak its small revenge. Three hours later – about 9 pm local time, Scholtz spotted “a flat vessel without a bridge in a rain squall,” and, thinking it was a larger vessel, fired an expensive torpedo at it, hearing detonations after eight minutes. Since no other ship was hit at that time, this is presumed to have been the redoubtable motor launch from the Somme. This patrol for the 2nd U-boat Flotilla began in Lorient on the 8th of January and ended there on the fourth of March 1942. While off the Hatteras area Scholtz and his men sank the Ocean Venture, Tolosa and Blink, the latter ship just west of the Bermuda region. A member of the 1927 Naval Academy Crew, Scholtz entered the U-boat arm in 1939. His Knights Cross was suppliements with the Oak Leaves in December 1941. Overall Scholtz underwent eight patrols, all in U-108, between February 1941 and July 1942, for a total of 361 patrol days. Over his career he sank 25 ships worth 128,190 tons. One of them, in April 1941 was the British Armed Merchant Cruiser (AMC) Rajputana, in the Straits of Denmark. 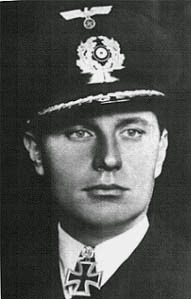 In September 1944 Scholtz was captured whilst commander of the 12th Flotilla in Bordeaux and held until April 1946. After the war he joined the Bundesmarine and was base commander in several locations, including Kiel and Wilhelmshaven. By 1966 he was Kapitän zur See and he passed away at age 79 in 1987.